mcclelland, ryan 2009. 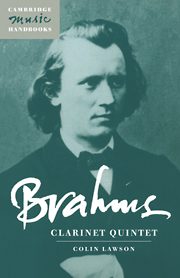 Brahms and the Principle of Destabilised Beginnings. Music Analysis, Vol. 28, Issue. 1, p. 3. Kelly, Elaine 2005. Brahms. Nineteenth-Century Music Review, Vol. 2, Issue. 02, p. 207. On its first appearance in 1891, Brahms' Clarinet Quintet was immediately recognised as a remarkable achievement, and a century later it still has the power to claim the hearts and minds of players and audiences alike. Widely regarded as Brahms' supreme achievement in the field of chamber music, the Clarinet Quintet is here placed in the context of the history of the clarinet and its repertory, and of Brahms' own compositions before 1891. The influence of the Meiningen clarinet virtuoso Richard Mühlfeld unleashed a new vein of creativity in Brahms, and this forms a basis for discussion, together with questions of performance practice (in relation to both clarinet and string quartet) and the legacy of Brahms' clarinet music. These chapters are complemented by a comprehensive analysis of the music.